Sometime last night, it seems. Update: Marita says it was Thursday night. Update: apparently it happened on Thursday night and so has been there a couple of days. Whoops! 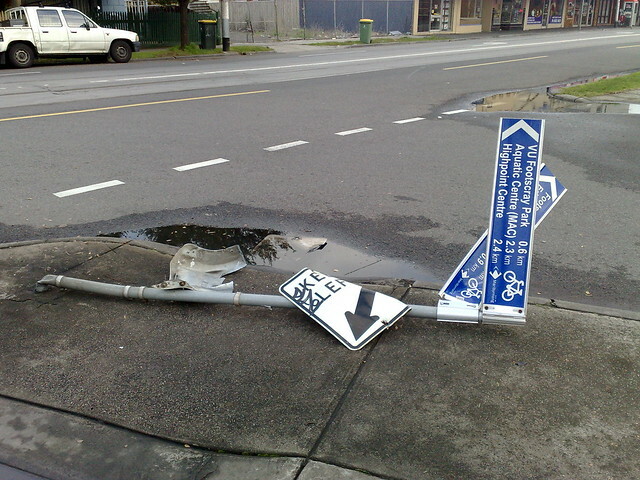 I confess it was me cycling to my mates in Footscray. I have a very sore head. Bought my first car! Yay me! (32yrs old isn’t too late, right?) Gonna be tough, giving up trains. Been riding them since high school. Almost didn’t make it to the dealership before they closed, what with the Sydenham line being so utterly packed that no one could get on, as usual. To be fair, the train stopped at Flinders St AND Parliament before hitting Melbourne Central, so no wonder people were pressed against the doors already. Oh well, not my problem anymore! Daniel what is your relationship with Footscray? You often post about it (Franco Cozzo, pedestrian bridge at the station etc). And by your photo’s you obviously visit our suburb. However we all know that you live in Bentleigh and work in the city. Not stalking – just curious. My girlfriend Marita lives in Footscray. I bought my first car at 48. Finally moved to a place where I *had* to have one. My recycling bin currently has one wheel and a giant dent in it at the moment due to similar behaviour. Still the council has said they would replace it within the week. It’s the shredded up garden bed and massively damaged safety rail that annoys me more.